Welcome to another week of CookBlogShare. I cannot believe we are on week 16 already, the weeks are flying by! As it is my turn to host the linky I have combined the round up and linky together. 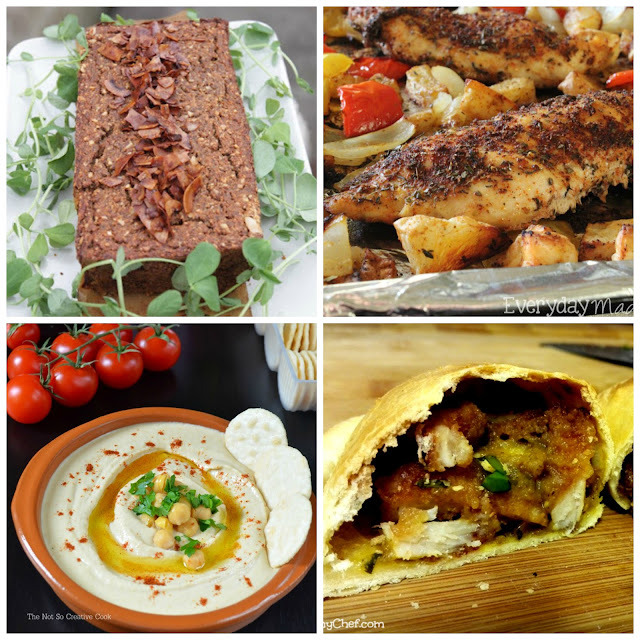 Last week we had an amazing 35 recipes linked up. Thank you for sharing so many delicious recipes and thank you to Hayley from SnapHappyBakes for hosting last week. For this weeks round up I am featuring four savoury recipes. There is no theme except from they are all meals that my family and I would love! First up is this Smoked Paprika Mushroom Loaf with Coconut 'Bacon' from Allotment 2 Kitchen. I love nut roasts but I love mushrooms even more so know I would enjoy this meal. I imagine that the mushrooms make the loaf more moist than a nut roast which can sometimes be a bit dry. The coconut bacon flakes are a fantastic idea for a meat substitute! Next up is a flavoursome tray bake of Cajun Chicken from Everyday Made Fresh. I love all in one meals like this. The flavours combine together to create an easy, full of flavour dish. Meals like this are perfect for a busy day when you want to be able to let the cooking process do all the hard work for you. Plus there is the added bonus of very little to wash up afterwards! The third recipe that I have chosen is a favourite dish of mine. I simply had to feature this Easy Microwave Hummus from The Not So Creative Cook. I love hummus and can eat it with anything! The difference with this hummus is that time has been taken to remove the chickpea skins. This gives you a lovely smooth hummus. This is definitely on my to try list! Last but not least I have chosen Chicken Katsu Empanadas from The Why Chef. I love empanadas and they remind me of my time living abroad. I remember empanadas being a firm favourite as a snack or light meal. The empanadas that I used to have were from typical Colombian recipes. I love how these empanadas have a curry sauce in them for an extra twist. If you did not see these four delicious recipes last week I definitely recommend that you take a look and prepare yourself to feel hungry! Now on to this weeks CookBlogShare. Please remember that you can add any foodie post both old and new. All I ask is that you add the badge (code below), comment on the host post and share the comment love. We all love to receive comments and that is what the community is all about. I cannot wait to see what you have been cooking up this week! Love the sound of the loaf with coconut bacon - yum! Look forward to seeing what everyone links up with this week. Hi Kirsty. Just linked up with my orzotto recipe. I'm also having trouble with the badge. I can't copy the code as a 'function disabled' message pops up. Sorry! Thank you so much for hosting, I am joining in again with another Savoury dish. Those Empanadas sound so good don't they - I really want to try them. I peel chickpeas for hummus too. I remember (le coin de) Mel wrote a post about how she had her children peeling them for an hour after I recommended it - I felt really mean as I can't imaging peeling chickpeas for an hour was all that exciting for them! Thank you so much for featuring my sheet pan cajun chicken! Thanks for hosting, and have a great week! Hi Kirsty, thanks for hosting the lovely party. Last week I couldn't join, my new post was not ready.Nice recipes in the round-up. All the recipes are so fantastic! The chicken cajun and empanadas have caught my eye especially, I use chicken in my own cooking more than any other meat, I'll have to give these 2 recipes a try. Thanks!